The professional restaurant chef quality cookware set from Korkmaz is the perfect integration of durability, style, and convenience. 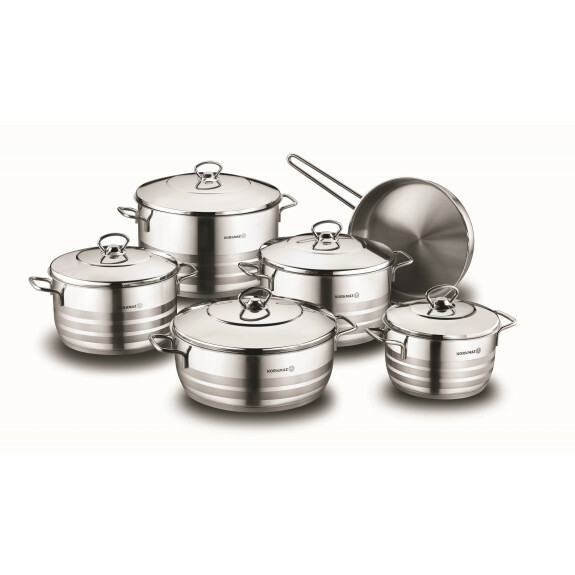 Made using innovative components that provides hands-on comfort and heat distribution, these pots and pan set are versatile to give you the perfect cooked meal for any occasion. WHAT MAKES KORKMAZ THE BEST CHOICE FOR HOME COOKERS? Korkmaz cookware set features specially cut aluminum surfaces in the steel capsule base that outperform efficiency in heat conduction. This saves you time and energy. Steel handles are safe to hold during cooking and baking, and makes moving and pouring a breeze. Bake extraordinary recipes for holidays season, special events or any day. It tolerates temperatures up to 550-degree F.
Toss it into the dishwasher for easy clean up or just non-metal cleaning sponges to keep its beauty.